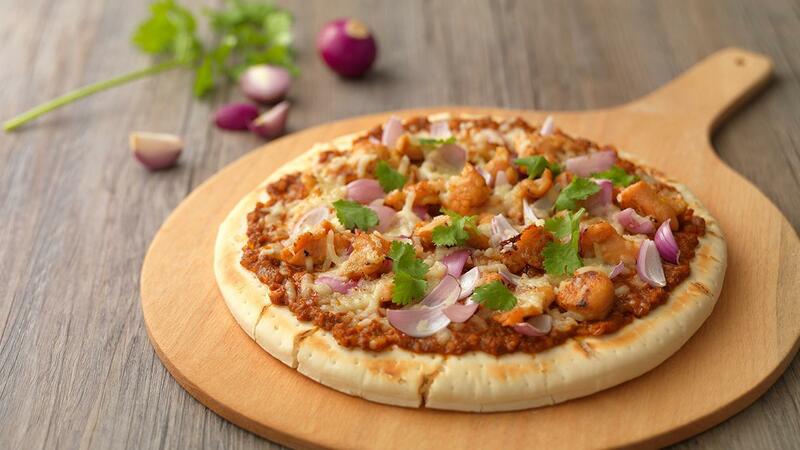 A great combination of Asian flavours in a pizza for something new for your menu. Blend shallot, garlic, young ginger, galangal, lemongrass into paste. Divide into 2. Use half amount for chicken marination and the other half for satay sauce. For chicken marination, add in half the paste with turmeric powder, chilli powder, Knorr Rock Sugar Honey Sauce and Knorr Chicken Stock. Marinate it with the chicken thigh for 2 hours. Grill until tender. Set aside. This is for topping. Saute the other half of the lemongrass blended paste with corn oil. Then add in chilli paste. Add roasted peanut, water, Lady's Choice Creamy Peanut Butter and Knorr Chicken Stock. Simmer to thicken the sauce. Set aside. This is for base sauce for pizza. Spread the satay sauce on top of pizza base. Place grilled chicken, chopped shallots, and Mozzarella on top. Bake in the oven for 10min at 170ᵒC.